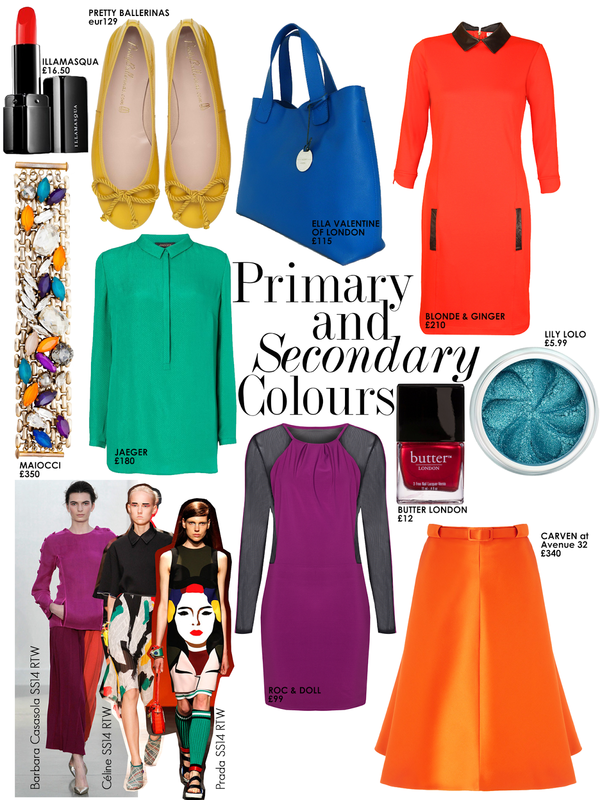 One of the biggest trends for SS14 is colour and most importantly the primary colours of red, yellow and blue and the secondary colours of green, orange and purple. At Prada and Celine, the colour palette accentuated the prints on display, whereas in the collection of London new-comer Barbara Cassasola, she opted for colour blocking. I think these colours work brilliantly, especially when worn with a hint of black or white to provide a base. When styling, I love to colour block as I find it adds interest and focus. However if you are similar to my personal style where I stick to the shade of black and more black, opt for a touch of colour in your accessories, with this fabulous tote by Ella Valentine or in your beauty. Blue eyeshadow was a hit on the SS14 catwalks with Badgley Mishcka, Marc Jacobs and Derek Lam opting for varying blue looks. I love Lily Lolo's, iridescent Pixie Sparkle Eyeshadow and there is even a video demonstrating how to apply. Another beauty tip is not to underestimate the power of a good nail colour, Butter London's striking red polish will create a striking statement. I have featured a few brands which I have discovered recently. Blonde & Ginger is a British womenswear brand created by previous fashion buyer, Elizabeth Carrick. Every garment in the collection is a limited edition with no more than 150 pieces made of any one design. Roc and Doll is a womenswear label established in 2005 by designer Lucy Bennett. The label creates collections which maintain a balance between feminine and edgy with trend led pieces encompassing distinct silhouettes, limited runs of designs and in a variety of fabrics. In whatever manner you decide to work the new colour trend of the season, remember to wear everything with confidence and don't be afraid to test out new looks. Fashion is designed to be exciting and fun, if you feel it's too much to become reminiscent of a Lego sculpture start your colour journey slowly.